When Baba started on 20th October from Anantapur towards Dharwar, from where He was scheduled to begin His weeklong tour of the Districts of North Mysore, someone asked Him, "This is sure to be a memorable tour; what shall we call it?" Baba immediately replied, "Amarapuriya Ananda-yatre!" (Heavenly Tour of Bliss). Yes, He had decided on it; He was directing it; He was the host and guest, everywhere; He was the goal and the guide! No wonder it brought heavenly bliss to millions of people. When His car, and the others that followed it, passed Bellary, the first town in Mysore State, the good news spread around gladdening the hearts of all who heard it, and they in turn communicated it to their near and dear ones. The news flashed with lightning speed in every direction. 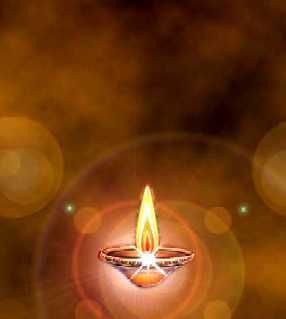 It was the eve of Deepavali, the Festival of Lights, and the news lit a lamp in every heart; the light spread from doorstep to doorstep throughout the region. At Gadag, there were many who had received signs of His Grace and who were gratefully adoring His Name and Form. They inspired many others and thus, a sizeable gathering with flowers in their hands assembled at the entrance of the town so as not to miss the chance of Darsan. Passing through Hulkoti and Annageri, where devotees stood on both sides of the road, singing Bhajans in the hope that Baba would stop and perhaps alight for a moment, Baba reached the outskirts of the busy city of Hubli, where the mayor of the corporation and about 3000 citizens acclaimed His arrival. The Mayor prayed for His blessings, so that Hubli could be "happy, healthy and prosperous." Dharwar was only twelve miles away. While entering the city, principal Dharwadkar and the erudite population of Vidyagiri, (Hill of Culture), a complex of many colleges and training institutes, cheered Him at the gates. Baba reached the University area and the Vice Chancellor's Bungalow at 9.30 p.m.
Dr. Appa Saheb Adke B.E., Ph.D., the Vice-chancellor, and organizer of the tour, had been ill ever since his visit to Australia in connection with University work. "I thought it was a simple affair, drafting the programme of His tour! But there was such a sincere pressure from all the corners of the region that I became perplexed. Realizing this quandary, Baba came to my rescue; He said that He will settle it Himself at Dharwar," Dr. Adke told me. "I was very ill when Baba came to Dharwar, but His arrival charged me with vitality; I am more vigorous than usual since that moment," he declared. He could hardly contain himself; no one could restrain him and remind him to be careful of his health. Baba gave Darsan to the thousands that had assembled from far and near, that night as well as next morning, in the spacious lawns of the bungalow. He met the office bearers of the Seva Samithis at 4 p.m., and quickly decided on the dates and the routes which He would use for the tour. That evening, there was a huge gathering, of at least 20.000 to listen to His Discourse. Dr. Adke welcomed Baba to Karnataka and said, "This University has today gained glory from this precious gift of grace. We deal here with materials and measurements, things that change, originate and degenerate; we are concerned with collection and codification, the intellectual process of analysis and synthesis; but alas we do not earn or confer wisdom! Our hearts are petrified; our brains have become books. Sri Rama awakened the stone that Ahalya [RRV:7b] had become through her craving for the trivial and temporary; when His Foot touched that stone, she was restored to life, beauty, and goodness. We too deserve that Divine Touch. Awaken us, Baba, and restore us to the life of truth, beauty and goodness, of Sathyam, Sivam and Sundaram!" Dr. Gokak, who has had years of intimate association with the city of Dharwar and the Karnataka University, called upon his compatriots to offer to Baba the multifarious anxieties, worries and weaknesses, defects and disabilities that were then weighing heavily on their hearts, and receive from Him in exchange, assurance of the Grace, which grants instant relief and constant joy. Baba began His Discourse in the Kannada language! It was an unexpected thing of compassion; it aroused an applause from each man, women and child when they realized that Baba's immeasurable Prema towards them has persuaded Him to speak for the first time in the language that they could comprehend, which echoed and re-echoed from the hills around! "Kasturi is not here! I have to speak to you without an interpreter. I have contacts with the Kannada region since twenty five years, but this is the first time I am addressing a gathering in Kannada. You praise your language, extolling it as Kasturi! (fragrant as musk) (*About Kasturi's name*) I hope I will not injure that reputation," Baba said. His Prema is so overpowering that He takes the words out of our mouths so that He can convey His message to us in ways we can receive with welcoming enthusiasm. His first venture into Kannada lasted for over an hour and a half, the diction and the exposition being as sweet and savory as the Telugu, which is His usual vehicle. The people of Dharwar were thrilled. "Oh, the delight that He imparted!" "Oh, the illumination that He granted!" "How fast was the flow of His Ganga" - these were the exclamations that filled the University atmosphere. After the discourse, Baba sang a few Bhajan songs, which the vast assembly sang after Him in chorus. The songs were in praise of God in a variety of Names and Forms as visualized by saints: Shiva, Rama, Sakthi, Krishna, [Bhajan: Govinda Krishna Jai - MP3] Subrahmanya, Vishnu. The sacred songs sung by Baba in His flute-like voice filled everyone with such supreme elation that there was genuine response. Many in the gathering were staunch and stalwart followers of creeds which stick only to one Name and Form; ordinarily they would have felt it a sacrilege to pronounce in reverence, much less sing in adoration, another Name and Form. Though the scriptures they follow declare that "The One God had many Names", "Ekam sad Vipraah bahudha vadanthi", they grow in a social atmosphere that insists on concentration on one name only, so that their faith may be fractionalized and enfeebled. Therefore, the Bhajans of Baba came as a refreshing breeze, cleansing the hearts of fanatic conformity, and sweeping out the cobwebs of fear! "Only Baba can overpower the habit of years and evoke in our hearts this spring of expansive joy", they exclaimed. Baba taps the very fountain of the religious urge, whether a person be a man or woman, young or old, Hindu, Buddhist, Parsi, Christian, Jain or Muslim, or even Agnostic, Nihilist, or Anarchist. From that day, the schedule laid down for the tour was rigorously gone through. Baba addressed a huge gathering at Vidyagiri, in the quadrangle of the Arts College. He planted a tree to keep His visit green in the memory of generations of students; He created a sapphire ring and gave it to Principal Dharwadkar. Then he spoke about the development of discipline and the earning of character. "My Message is this: Be embodiments of Prema (Love); Do not hate anyone or fear anyone. Develop Love towards all; understand the grief, and the joy of others; be happy when others are happy; don't exult when others are in misery." "Learn, even while you are learning good attitudes and habits, the art of silence and meditation, for example. These will help you to succeed in the School of Living. This is the most precious lesson available from Sanathan Dharma, which, let Me assure you, will be re-established in all its glory throughout the world, so that the world might have peace and prosperity. That is the mission upon which I have come." From Vidyagiri, Baba motored to Hubli, where a mammoth assembly was spilling over the Karnatak medical college buildings yearning to have His Darsan, and to listen to His Discourse. The good tidings that Baba was speaking in Kannada had spread to Hubli and beyond, and all ears were alert to catch the speech and treasure it. "Today is Deepavali, when you consume sweets, but, the component that sweetens every dish is sugar. So too, the article that bestows the characteristics of Existence (It is), Knowledge (It can be known), and Ananda (it confers joy), on every 'thing' and 'being' is the Atma, which, when Name-bound and Form-bound, is God." "For a four-lettered degree, you spend the best part of your life; for attaining the Degree of Degrees, namely Grace, can you not spend at least five minutes a day, contemplating silently on the mystery and majesty of God, which is evident in the construction, the functioning, and the disintegration of every atom and cell?" On the 23rd, Baba proceeded along the Sirsi Road to the West Coast. Leaving Dharwar at 9 a.m., Baba neared the village of Mundagod forty-five minutes later. The highway passes only through a few villages, for in this part of the country houses are situated not on streets, but they peep furtively in twos and threes from between huge bushes and trees in plantations or forests; so people from as far as twenty to twenty five miles away from the road had trekked to Mundagod for the coveted Darsan of the Avatar of the Age. More than 4.000 simple peasants and plantation laborers were there. Their eyes got a glint of joy when Baba moved among them and granted the curative Vibhuti created on the spot to three broken minds which He espied in their midst. Baba spoke a few words to them about Namasmaran and Bhajan; He sang three Bhajans so that they could feel the exhilaration that Bhajan could give, and the gathering did their best to repeat the lines in tune with His entrancing melody. From then on, the road was sanctified every few hundred yards by song and dance! At Malagi, Ekkambi, Isalur, and Gowdalli, the sincerity of the villagers was appreciated by Baba so much that He alighted from the car and stood facing the disciplined throng for a few minutes, so that they may imprint His form on their hearts, just as they had already inscribed His Name on their tongues. Dr. Adke writes, "Whenever He noticed a gathering on the roadside, Baba used to stand on the foot board of the car, with the door open. People pressed upon the door, in their frantic attempts to get as near Him as possible and touch His Feet. But, wonder of wonders, the door did not move even an inch! Hundreds pushed themselves forward on the door that was well ajar, but it stood firm, without even a shiver!" "See the effect of the singing of the Name. If a few minutes of Namasmaran could confer this much of Grace, how much more can you gain by constant uninterrupted Namasmaran! The yearning which you cultivated in your minds for My Darsan has fructified today. I am happy to share My Love. May this give-and-take become a continuous process!" When Baba descended from the dais, there was not a dry eye among the 40.000 before Him; tears of gratitude and ecstasy were visible. Baba returned to the Gopalkrishna Temple, and looked at the exhibition of photographs of Himself and His activities. He moved from thence, without even the rest that many pleaded with Him to take, on the next leg of the tour - towards Karwar, on the Arabian sea! The road was walled on both sides by thick masses of pilgrims, standing in eager expectation. One could read the name-board of villages - Nilekani, Hanumanthi, Marugara, Amminahalli, Janmane, Kasage, Kathagala, Hiregutti. In many places, yielding to the silent importunity, Baba alighted for a minute or two, to bless the crowd with a smile that was immediately reflected on every face. At Ankola, the importunity became a little too boisterous and so Baba moved on, with just a wave of His hand, which itself, was to them a comforting gesture of Blessing! The small village of Aversa presented a clean festive appearance, with festoons and banners, arches and greenery, across the road. The assembly of over 5.000 persons was a model of disciplined devotion. Baba spent a long time walking along the lanes, between men and women, and seeking out for succor the sick and the distressed. Winning the affectionate loyalty of all by this gesture of compassion, Baba ascended the rostrum and spoke about the Truth of Identity, that is now ridden by the Falsehood of Diversity. "The Truth shall make you fearless, for where there is only One, how can fear arise?" He asked. "The Name for that One is God; remind yourself of the One, when you rise from bed; recollect that One during the vocations of the day; establish the faith in the One, in the heart when you go to sleep, so that when the senses, the intellect, and the imagination are inactive, the One might fill you and favor you with the bliss of its realization," He advised. The Aversans were not disappointed; they feared that Baba might not sing Bhajans, since they discovered signs of hurry among the entourage. Karwar was waiting, miles away, since about noon! But, Baba sang and filled the cup of joy to the very brim. "This vast expanse of water on one side, this vast expanse of humanity on the other and this vast expanse of Grace in between!" - that was how Baba described the scene on the Marina that day. "That is the Ganga; this the Yamuna; and My Grace which is silently gurgling within your hearts is the Saraswathi," Baba declared, sending the 25.000 devotees assembled there into the seventh heaven of bliss! 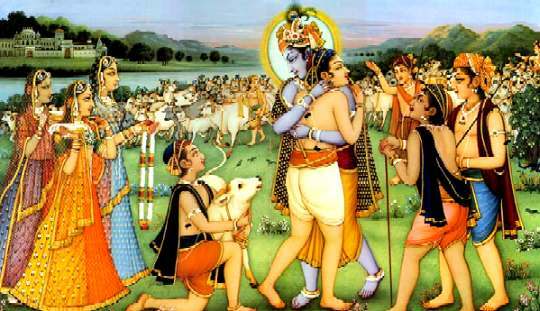 "This meeting should have begun hours earlier; but the serried ranks of devotees standing on the road shared that time with you; I gave it to them on your behalf; for, they too are Atmaswaroop, having the same Atma illumining and inspiring them, instructing and guiding them towards the Paramatma." "Their gratitude is your gain," Baba announced. The waves whispered into the ears of seashells how happy they were that they could be silent when Baba sang Bhajans for Karwar to echo in full-throated exhilaration. Night was spent in the bungalow of the collector, from where one could see the wave-crests shimmering in starling. Next morning, Baba went into the Sitarameshwar Temple, which is to Karwar, as heart to the body, and from there He drove to the suburban settlement of Kodibag, where deft and devoted hands had erected a temple for the Previous Body and carved a statue for installation. The joy of the settlement dwellers knew no bounds; it was indeed a revealing ceremony, the Installation by Baba and the homage from them to the Sai, actually present before them. From Kodibag, Baba went along the coastal road to where the motor launch was to take the party, cars and all, across the tongue of sea that is yet to be bridged. The Kali river joins the sea at this point, and so the tongue tastes no salinity. Baba drew the attention of Dr. Adke, his son Manohar and others in the launch, to the pearly aquamarine which the sea was, a furlong away! Baba remarked, "Crossing the Sea of Samsar, be confident of victory, since the Master is with you." "Why fear when I am near!" Retrieving the cars from the launch, the journey was resumed fast and when the State of Goa was entered, it was about ten. About half an hour later they reached Marga, where, too, aspirants for Grace were ready in their thousands. It was difficult to restrain them from their yearning to touch the Lotus Feet, and so Baba found it rather hard to reach the platform soon. His abounding Love overcame the resentment that mortals might have felt under similar circumstances; He walked coolly among the excited gathering: He recognized a sick person and materialized a portrait of Christ for him, for He knew, though it was not evident for others, that he was a Christian. He created Vibhuti and placed it in the hands of another person whom they guessed was a Hindu, though the curative wonder can well be given to followers of all creeds. Baba spoke for about twenty minutes on the three Gunas, the dull, the passionate and the balanced, and how man can liberate himself from the apathy of Thamas and reach the enthusiasm of Rajas and finally attain the equipoise of Sathwa Guna. Then, Baba moved on to the capital city of Goa, Panaji. The Samithi at Panaji had arranged a public meeting which Baba was to address in the "Vivekananda Hall" on the upper floor of the Secretariat Buildings! No hall on earth can accommodate in comfort the audience that Baba draws to Himself in any town! He has said often, that the sky shall be the roof of the Shamiana for the assemblies He addressed! Therefore, the inevitable happened. A very large section was denied the chance of Darsan. Baba spoke for some time and sang Bhajans, which delighted those in the hall. Those who heard the discourse and melody from outside said, "Better luck, next time!" "Thanks at least for this much"; this was the consolation of the thousands who could not get into the hall. Dr. Adke writes, "When we were nearing Goa, the springs of the Fiat car were damaged. But when I suggested getting another car for the onward journey, Baba told me, 'We shall drive in this car only!' The road from Goa to Belgaum runs through thick forests and ghats, and was also breached by rains. We started from Goa late in the evening and reached Belgaum at nine. How we reached the destination without a breakdown is a mystery that Baba alone can explain. We knew that it was Baba's Grace that brought the party safe." At Belgaum, Baba went straight into the enormous gathering of about 70.000 persons waiting for Darsan. Belgaum is a big city and Baba is the Supreme Savior. 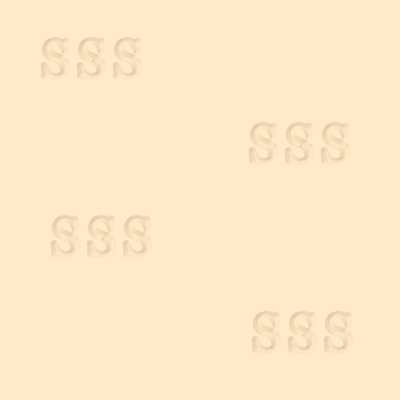 The Sathya Sai Seva Samithi had taken elaborate precautions against any stampede; they had put up barricades of tough bamboo to sectionalize the gathering and provide vacant paths in between, for Baba to walk along and confer Darsan from within a few feet for all. When intimation was received that Baba had come, they rose in haste and rushed towards where they sensed He was! The home guards, the volunteers (men and women), the boy scouts, and members of the Samithi sprang into action and curbed the excited crowds as best as they could. Meanwhile, Baba had come on the dais; His golden voice floated in ever-widening circles far and wide. Everyone stood where he was and drank the ambrosia. Each man turned towards the place from where the call had come. Sri Narke, an engineer who was of the party says, "Bhagavan raised His Hand! Every man was fixed to the spot where he stood! Bhagavan's Hand came down; they sat silently, wherever they were." "I couldn't leave Goa in time. There were eager groups of devotees waiting at every village, whether we passed through jungle or bald fallow wastes. How can I ignore their tremendous thirst?" Baba said. "I borrowed a little time from you and gave it to them," He confessed. The gathering became gentle and calm. "Having joined this uplifting a gathering of thousands of seekers of light, eager to cleanse themselves and become worthy of their divine destiny, you have a responsibility: Try to realize that you are fundamentally divine; practice meditation for a few minutes every day to instill this faith into yourself," He advised. "The boulder on the hill is turned into an idol for the temple. Hammer and chisel have made it a thing of beauty and a joy forever, a perpetual source of inspiration to render life wholesome and holy! You too must subject yourselves to the hammer of discipline and the chisel of pleasure-pain, so that you emerge from the boulder into an authentic Image of God!" He exhorted. "I have been touring Karnataka since five days; I wish to emphasize one point now. Thousands of people are attending such meetings; thousands more are waiting along the roads. In the heart of every one of them, I know, sincere adoration is welling up towards God. But adoration must be regulated through discipline. It should not be wild and untended. You rush forward to touch My feet or to prostrate before Me, regardless of any consideration for women, children, the aged and the sick. You fall upon them when you press forward toward Me. Do not injure the Sai in those people, when you rush towards this Sai, to demonstrate your devotion! The merit and all the austerity you undergo to see and hear this Sai is well nigh cancelled, when you inflict pain on the Sai who resides in them," He said. Many bowed their heads in repentance and shame. "Cultivate love, tolerance and reverence towards the weak, the handicapped, the distressed and the diseased. Give them your compassion and sympathy. Serve them, sensing the divine bond of kinship," Baba directed. Baba resumed the tour next morning, taking the road to Bijapur, the Headquarters of another District in North Karnataka. Within miles He alighted at Bali-Hongal where devoted hearts prayed for the triple gifts of Darsan, Sparsan and Sambhashan: seeing Him, touching Him and listening to Him. He conferred on them the first and the last of these only, for there were thousands so early in the day! Baba spoke to them of inner purification and the awareness of the constant presence of God as the means to ensure it. Throughout the day, miles after mile, it was Bhajan and Kirtan all along the road to Bijapur. The villagers waited, watching the cars that passed along, for hours at a stretch, doing Bhajan. They halted every scooter and truck, to find out whether Baba had started, and was on the way. Some villages got ready a folk welcome with traditional drums and dances; some brought out long brass horns which they blew loud and long to awaken the countryside into the glorious day. Some paraded the temple umbrella and persuaded temple priests to stand across the road, with ceremonial pots of holy water in their hands and Vedic chants on their tongues! There were police cars before and behind the cars of the party; while the officers tried to regulate the enthusiasm of the village gatherings, they themselves were not above the temptation to seize as many chances as they could, to touch His Feet! Baba halted for about an hour at Gokak at noon, and proceeded apace to Bijapur, the journey being interrupted every few miles by yearning on one side and compassion on the other. For those who were with Baba in the same car, it was a boon of unstinted ecstasy. Baba sang many songs, asked all else to sing Bhajans, prompted one or two to compose poems on the spot about the epic, unfolding before their eyes; thus as the road rolled away, fast, from underneath the car, they lost all sense of time and space. "At Bijapur, the gathering was packed thick for miles," writes Dr. Adke. "I made bold to suggest to Baba, "This meeting has to be cancelled! It is impossible to go through this item of the tour! Let us go to the next place." Baba said, "No." At least 75.000 persons were surging impatiently over the roads and open spaces. Dr. Adke writes, "Baba went right into that sea of agitated confusion. Everyone was nervous about the situation. But soon we saw Him safe on the dais under the blaring lights and before the microphone. As soon as Baba started singing the usual introductory verse, every man, woman and child was enchanted; the waves were stilled, quiet prevailed, and we were relieved." "For what purpose were you born? What has been your achievement in the years that you have spent as men among men? What are you intending to leave behind when you die?" Baba asked the vast gathering. Vineetha Ramachandra Rao, who was of the party, writes, "We have heard that when Krishna played on the Flute, even the thousand-hooded snake lay low; when Baba spoke in that captivating voice even though His opening sentences were so challenging to their self-complacence and indolence, the seventy five thousand-hooded snake lay calm, plunged in self-examination. Baba advised each one to cultivate Love, for "Love is the motivator of the Universe, Love is God and Love alone can win the Grace of God and merge man in God." When Baba spoke of the efficacy of Bhajan and sang a few songs, the assembly yielded without reservation to the magic of His Flute! All the higher tendencies sprouted, foliated, put forth buds and blossomed in the heart; everyone felt a thrill, the thrill of Cosmic Awareness." Spending the night at the circuit house, Baba rose early and was ready to fulfill the engagements He had planned for the day. A score of minutes ticked away as they drove forward; they were surprised to see across the road, a pandal of green and yellow creepers and festoons, flags and garlands, and on the ground, about a hundred persons singing Prasanthi Nilayam Bhajans! Let us listen to Dr. Adke describing what happened: "They beseeched Baba to drive into their village which was only two miles off; they said they had repaired the road and made it car-worthy; they promised they would be quiet and disciplined; they announced that the villagers were longing for His visit. I was anxious about the correct execution of the busy timetable already laid down for the day. But Baba said, "Well, we shall go and be with them for five minutes." The cars turned, traversed the clean dustless road which had been sprinkled thick with water, into the village. As the cars passed, lamps waved, women scattered flowers on the car. The men blew horns and beat big drums. Bells on the necks of cattle tinkled as they stood on the sides, with red paint on their horns. Baba was happy to see the villagers sitting with the surge of joy lending luster to their eyes. He sang a few Bhajans, encouraging the assembly to sing them after Him, without hesitation and fear. Baba drove back to the main road only after spending about forty minutes there. It was one continuous flood of devotion, fertilizing the entire area, entering into every home, every heart, arousing man, woman and child: Baba could not bear to see the people sitting or standing in the sun. Nor could He allow them to be glum and cheerless. While moving from Bijapur to Bagalkot, Baba sang a large number of songs in Kannada to the delight of the Vice-chancellor, his son, and others. He sang songs composed by the famous medieval Kannada saints, Purandara Das and Kanaka Das; He described the story of Kanaka Das at Udipi, where the idol of Krishna installed by Madhawacharya turned around in order to give the shepherd saint Kanaka Das the Darsan he longed for. For Kanaka Das was not admitted into the temple since he was a person of inferior caste! Baba also sang some songs composed by Him on the spot in Kannada. It was a glorious hour for lovers of that language and seekers longing for the Divine. Passing through places like Kerur, where devotees fed their eyes on Him, Baba reached Nargund, and saw about twelve thousand people gathered there from all the villages around, and even from Hubli and Dharwar, which were hours away by car. He told them of the immanence of God in the universe, and said that only a perfected, pure intelligence can recognize that fact; just as only the one tongue among all the limbs and organs of the body can recognize the salt dissolved in water. Passing through wavy fields of grass and grain, fondled by the soft caresses of stray breezes, Baba reached Navilgund in the evening. A sea of faces sat before Him in disciplined silence and Baba spoke to them and sang for them in plentiful compassion. "The objective world is ever changeful; it is fitful and flickering, but the Atma is eternal, adamant, unaffected by time, space and causation, which are only modifications it is supposed to undergo! Ekam eva adwithiyam Brahma: One only, without a second, is Brahma. To become aware of the One, which has no second, you must practice the five disciplines of Mantra, Namasmaran, Yoga, Dhyana and Samadhi. Just as the music and the musician immanent in the ether, as waves projected by the broadcasting station are caught and made manifest by the receiver and its many contrivances, God who is present but unmanifest to the eye or mind, can be realized and recognized, through these contrivances," Baba explained. The sun must have traveled slower than usual that day, for Baba was able to reach Hulkoti at 6 p.m., after a halt at Annigeri on the way to receive flowers and shower blessings on a huge gathering on the roadside. There was a record crowd of eager devotees at Kulkoti and Baba gave them Darsan as well as the assurance of His continuing Grace. He then left for Gadag, a city famous since centuries for the Veera Narayana temple, immortalized in Kannada poetry and at present a great center of commerce and industry. Gadag astounded everyone by the enormity of the number of people who assembled there to revere Baba. There were over a hundred thousand! Mrthyor Ma Amrtham Gamaya (From death, lead me to Immortality!). He said that distinction is unreal, egoism is darkness, and desire is death! So, man must become aware of the One of which He is a spark, of the One which is all this and more, the One which fills and fulfils all." The Bhajans that Baba sang and which the voices repeated, cleared the sky of the vibrations of multiplicity and filled it with the "is-ness" of the One. Rama, Krishna, Sakthi, Siva, Vishnu, all were integrated in the melody of that music of the masses, offered at the Feet of Sai at His bidding, and in tune with His cosmic voice. When Dharwar was reached, lights in most of the houses had been extinguished, and cows were dozing on the roads, chewing the day's fast-eaten food! When the sun rose next day over the horizon, the calendar showed October 27, as the date. And Baba was as fresh as the Sun who shows no tinge of tiresomeness, however long the journey, however monotonous the route, however fulsome the acclamation offered to Him in however many languages, however gladly He is welcomed in however many lands by however many billions! He was as aware of His Mission and as unassuming in its performance as the Sun! But, others of the party, who were mere men, aroused His pity. He persuaded Dr. Adke, his son and others to take rest, in spite of their disinclination. As for Himself, He spent the day visiting the homes of devotees at Hubli and Dharwar, for, as Baba has often said, "Your Ananda is what sustains Me" (Mee Anandame naa Aahaaram). When Baba visits a home, however short the stay, He leaves it a Heaven of Peace and Love. Often He goes alone into the house in order that 'the devotee may not be distracted by the need to attend to the companions!' He persuades the devotee not to indulge in pompous receptions and invest in exhibitionistic decorations, exotic garlands, expensive feasts or quick publicity among kinsmen and friends. He comes as our nearest and dearest kinsman, arriving after a long absence, to bless, to heal, to enrich, to elevate, to alleviate, to console and correct, to confer courage and conviction and confirm the consummation of spiritual aspiration. He fondles the children, recognizes even slight gestures of homage, remembers the names of everyone in the family, relates incidents unknown or forgotten, promises relief, and leaves everyone grateful. Where gloom hung thick, He installs joy; where the musty air of sickness was repelling, He brings the fresh fragrance of health and hilarity. His visit to a home closes the chapter of disease, despair, distress and doubt and opens another, tingling with joy and cheer, peace and goodwill, vigor and vibrant harmony. Monday, the 28th! He was to reach Brindavan that evening, and so, He drove along the Hubli-Davangere Road, lighting the faces and lightening the hearts of the residents of those villages and towns, adjacent to that road. Kundgol was the first place where a gathering had collected, under the auspices of the Sathya Sai Seva Samithi. And what a gathering! The wide expanse of a football field packed thick! At least 25.000 in number! Baba spoke of Indian culture, of the word 'Bharath,' of the syllable 'Bha', which He interpreted as Light, the Light of Spiritual Realization, the light that reveals the identity of all as God. He said that His heart was filled with joy at the Love that had induced them to wait for His Darsan for hours since early dawn. "Extend this Love towards all, for I am in all," He suggested. "Devotion to Me is to be expressed through service, love and cooperation and by refraining from scandal mongering, faultfinding and hatred," He emphasized. When He sang a few Bhajans towards the close, harmony reigned and distraction disappeared from the inner and outer atmosphere. Karjigi was the next place where Baba blessed the people. Then Baba visited the holy village of Agadi, renowned as the hermitage of the late Saint Seshaachala Swami. Saints and sages are the sappers and miners, the road-makers, surveyors, the bridge builders who prepare for the Avatar. Baba was received at the entrance to the shrine by women waving lamps, and Vedic Scholars chanting hymns of prayer and supplication. He moved among the vast congregation which was engaged in Bhajan, and later spoke to them of the efficacy of the Name and the discipline of constant repetition of the Name. The stream of cars bringing redemption and relief was delayed a while at Haveri. Baba went to the Grama Seva Mantap (Home for Village Reconstruction) and addressed the gathering, composed of students of the Agriculture and other colleges of the place. He drew their attention to the setting of natural beauty and grandeur where they had met and said that it was a heritage which all can share. "You have another heritage which all can share and that is, the Grace of God," He said. He advised them to learn well at college, and also learn the art of being at peace with themselves and others, through Namasmaran and Bhajan. When Baba sang Bhajans, about a dozen sleek cows of the Mantap were seen listening with a glint in the eye and a tingle in the ear. There was an enceinte (pregnant) cow in the group; the calf hurried out into the world in its eagerness to listen to the voice of Brindavan. At Rane Bennur, Baba laid the foundation stone of the Arts and Science College and proceeded to the Cotton Market, where 25.000 devoted persons were awaiting Darsan. 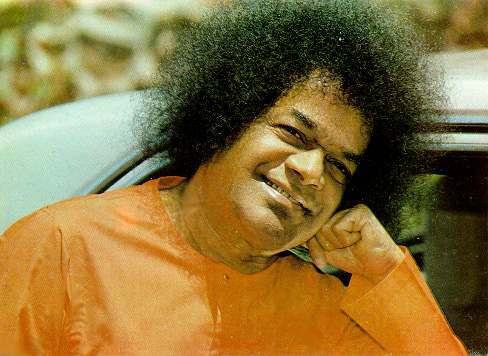 "Let your words be charged with Truth; let your deeds be charged with Sincerity - Sathyam Vada; Dharmam Chara - Talk in Truth, walk in Righteousness; that is the way to reach the goal and find it," Baba advised. The vast gathering got and hour of bliss, through word and song, that day. Baba motored from Rane Bennur through lines of devotees that thronged the roads to Harihar (where He alighted from the car and gave Darsan for a few minutes) and at Davangere, Chitaldrug, Sira and Tumkur to Brindavan, carrying with Him the Love and rapturous devotion of the millions His Grace had captivated. Dr. Adke writes, "I had the good fortune of being with Baba and witnessing the grateful joy of people everywhere and the happiness of Baba at their sincerity and simplicity. I was able to go as far as Whitefield, near Bangalore, where Brindavan is, and take leave of Baba from there. When I left, Baba said, 'Do not think you are going back alone! I am with you! Let us both go together!' That is the measure of His Love, His Omnipresence, His Omnipotence, His Divinity!" The adoration offered to Baba and the attention with which huge gatherings at every place, whether it be a hamlet or village, a city of colleges or of factories, a historic spot or a place of pilgrimage, treasured His words of hope and promise, are eye-openers to those who plan for the future. They reveal that people are eminently responsive to the call of the spirit towards the higher life, that the fascination for short cuts and artificial props to happiness cannot withstand the charm of the Divine Directive of Baba. Baba began this tour on Deepavali, the Day when India celebrates the Festival of Lights. Sri Aurobindo writes in 'the Synthesis of Yoga', "The Guru should awaken the Divine Light and set working the Divine Force." Baba awakened the Divine light; in every heart, He lit the lamps, He, the Divine, aroused the Divine Force.